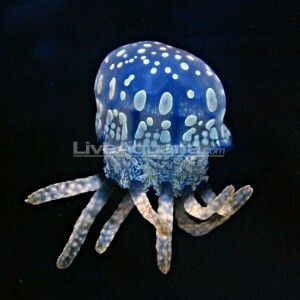 LiveAquaria has listed another gorgeous oddball in their Diver’s Den. The stunning blue and tan Mastigias papua jellyfish can thrive long-term given the proper environment. This environment would include proper feeding and lighting, as well as equipment preparation. Pump intakes and overflow boxes for example can be very hazardous to this animals, as it could be easily sucked into either. Placing foam on pump intakes could prevent the jellyfish from becoming impeller food. 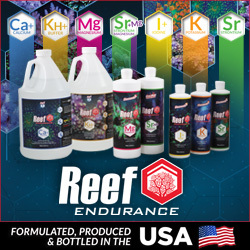 Additionally, this jellyfish also requires a varied diet, including zooplankton-based foods, but it will also benefit from moderate to intense lighting since they are also photosynthetic. Zooxanthellae live within the jellyfish’s tissues and provide nutrition to the animal in much the same way corals do. © 2010 Drs. Foster and Smith, Inc.